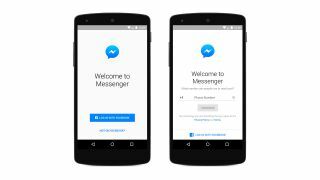 Facebook has announced it's now giving users the option to sign up for its Messenger chat app without needing to have a Facebook account. "If you're in Canada, the United States, Peru or Venezuela, we are starting to roll out a new way for you to sign up for Messenger - without a Facebook account," the social network said in a blog post. You will, however, need a phone number (and to live in the above mentioned countries, until Facebook rolls out the new feature to the rest of the world). After opening up the app on a phone, tablet or the web, you'll be asked if you want to sign up with a Facebook account or if you're "Not on Facebook." If you don't have an account, you'll be given the option to upload your phone contacts. Messenger will then match users that have their numbers linked to their Facebook (or Messenger) accounts. The new update to the chat application will give Facebook-less users regular Messenger features, like photos, videos, group chats, voice and video calling and stickers. However, if you don't have a Facebook account, you will miss out on things like syncing across phones, tablets and web as well as accessing Facebook friends' contacts and older messages. Still, by opening up Messenger to people who don't want a Facebook account should put the company's chat app in a better position against its competition, like WhatsApp and Viber. Will you be signing on to a Facebook-less Messenger?